Forest degradation has historically been overlooked in accounting and monitoring carbon stocks. A recent study combined ground-based inventory, satellite and LiDAR data to record the loss of carbon due to forest degradation in areas exposed to logging, fire damage, or both, in the arc of deforestation of the southeastern Amazon. The study revealed that fire damage causes greater losses than logging, and fire-damaged forests recovered more slowly than logged forests. Accurate depictions of both deforestation and degradation are necessary to establish emissions baselines used to inform programs to reduce emissions from deforestation and forest degradation (REDD+). The shrieking rip of a chainsaw and the muffled roar of fire: both of these sounds are associated with extensive destruction of Amazon rainforest. But is logging or human-caused fire a larger issue for the fate of the Amazon? And when such activities culminate in a partially degraded forest – rather than complete deforestation – is there much cause for alarm? A recent study published in Environmental Research Letters explored these questions. Using a combination of ground-based, satellite and LiDAR data, scientists from the University of Maryland and NASA recorded the loss of carbon due to forest degradation in areas exposed to logging, fire damage, or both, in 20,000 square kilometers (7,722 square miles) of the southeast Amazon’s “arc of deforestation,” a crescent-shaped strip of intensive forest conversion along the southern and eastern edges of the forest. The Amazon arc of deforestation stretches across the southern and eastern edges of the forest and is rapidly expanding into the forest’s core. 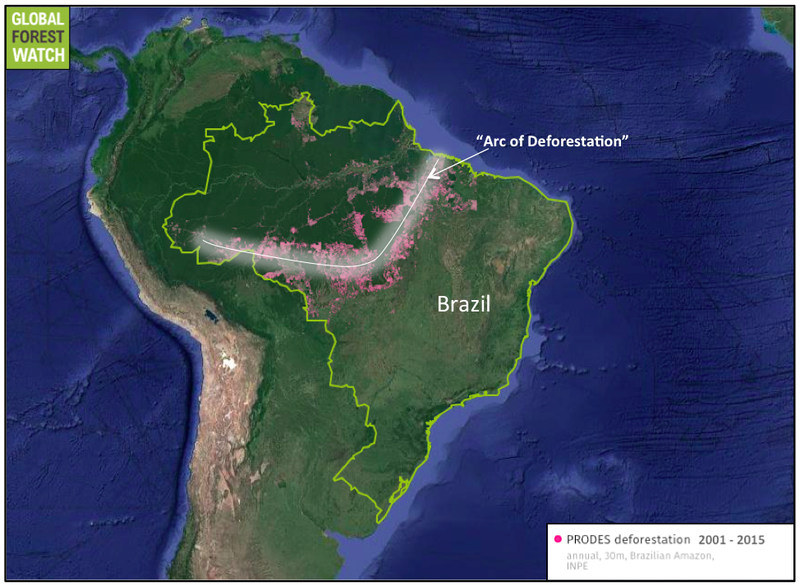 Data in Global Forest Watch from Hansen et al (2013) and Brazil’s National Institute of Space Research (INPE) PRODES project. The researchers found that degraded forest stands contained an average of 45.1 percent of the amount of carbon stored in intact forest stands. They compared the impacts of fire and logging, the two most prominent drivers of loss of forest carbon stocks. Fires not only resulted in higher loss of stored carbon than logging, but fire-damaged forests also recovered more slowly than logged forests. Forests subjected to fire remained more impacted after 15 years than forests subjected to logging after the same duration, and neither type of forest recovered to pre-disturbance carbon density. Degradation, unlike deforestation, is not absolute. Instead of a complete elimination of forest from the land, degradation is a more subtle process through which patches of forest, or even just individual trees, are lost. But the loss is still significant: 50,815 square kilometers (19,620 square miles) of forest in the Brazilian Amazon was degraded between 2000 and 2010, and emissions from degradation in the Amazon may be higher than those from deforestation. Additionally, the decreased structural complexity of degraded forests cannot support as much biodiversity as primary, undamaged forest. 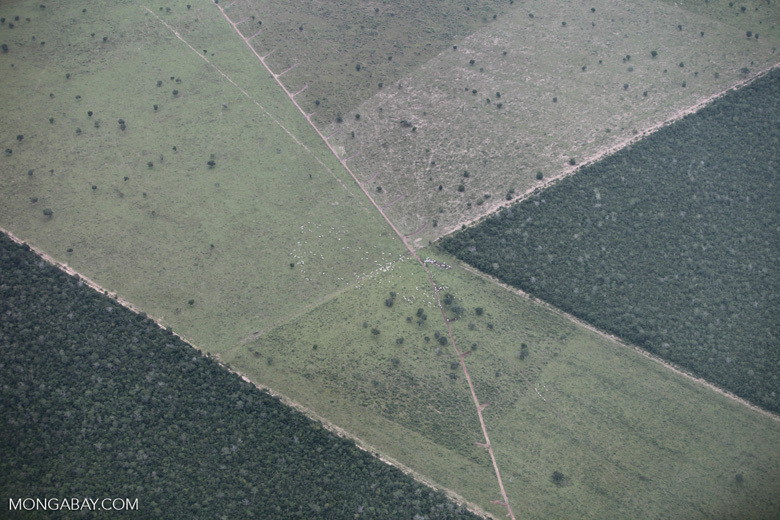 Although deforestation (left) is absolute and uniform, forest degradation (right) tends to be more irregular and patchy. 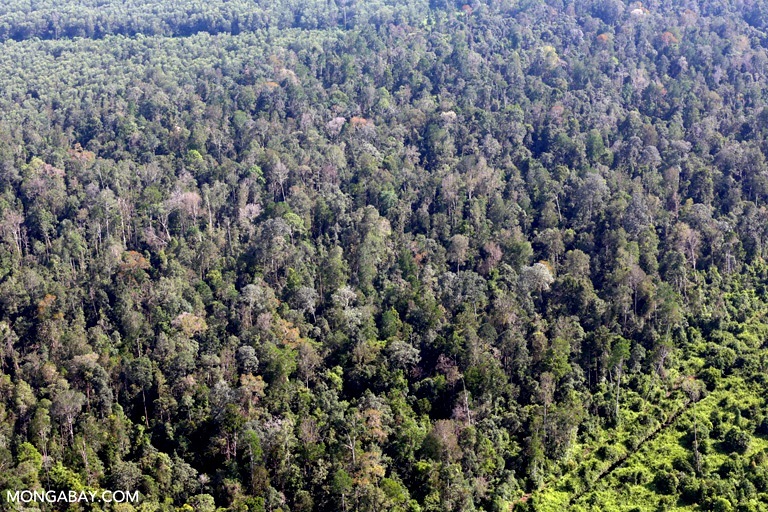 Its effects on the forest interior are often undetectable from satellite imagery. Images by Rhett A. Butler/Mongabay. 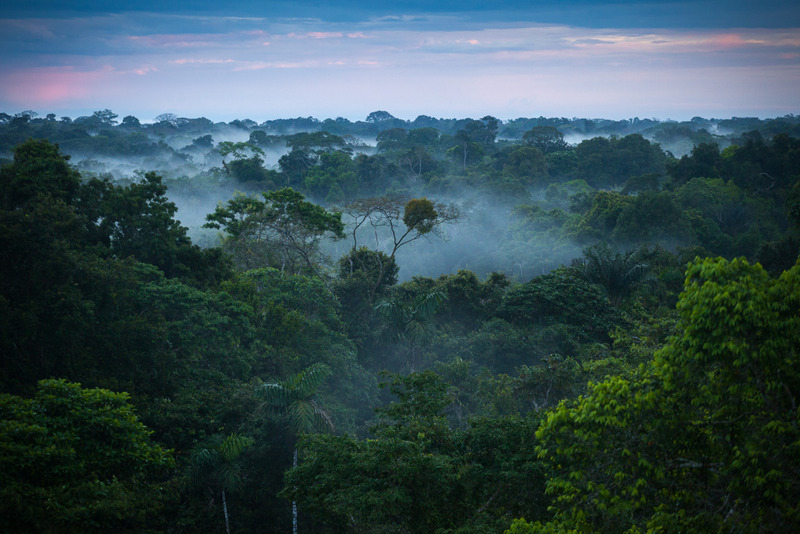 Scientists have monitored deforestation for several decades using both on-the-ground and remote methods. Although clear-cut logging continues in earnest across the Amazon, deforestation rates in the Brazilian Amazon are lower than in the early 2000s. Degradation, on the other hand, remains a growing issue and historically has received less attention than forest loss. Measuring irregular losses in Amazon forest carbon stock is difficult. Selective logging targets valuable hardwood tree species such as ironwood and mahogany and typically removes several trees per hectare. Similarly, understory fires – caused by agricultural development, flammable debris leftover from logging, or careless disposal of cigarettes – may leave canopy foliage intact despite a charred underbelly. Modern-day satellite images cannot penetrate the forest canopy to record potential damage below, and isolated instances of degradation may not be visible at the 30-meter or higher resolution of standard satellite imagery. Surveillance by foot can more clearly identify degraded forests but is unfeasible for areas larger than a few hectares (or acres). In the last few decades, fortunately, a groundbreaking tool has managed to achieve both the fine resolution of ground inventory and the broad coverage of satellite data. Light Detection and Ranging (LiDAR) is a method of remote sensing that uses light waves to measure distances to a target (in this case the Earth’s surface and vegetation) from a transmitter. Lasers are fired, typically from an airplane, at up to 150,000 pulses per second and bounce back to a highly acute sensor located near the source of the lasers. The distance to the target is calculated from how long it takes for the lasers to return, and different spectrums of light can be fired in order to survey different materials or structural properties. Combining the calculated distances travelled by individual lasers, each to a different point of the target, with a highly precise GPS system results in an impressively accurate three-dimensional representation of the target structure. An airborne LiDAR system includes a GPS to provide the plane’s position, an Inertial Motion Unit (IMU) to record the aircraft’s altitude, and a laser that scans back and forth across the terrain below. The laser sends many thousands of light pulses toward Earth that bounce back to the scanner. The return time of the pulses represents the distances from the known height of the plane to the surfaces below. The distance data are used to generate information about the shape and structure of the area’s vegetation. Image by University of Texas Coastal Studies Group. The high-resolution data LiDAR produces enable scientists to assess the variability in canopy height, a metric of forest ecological stability. 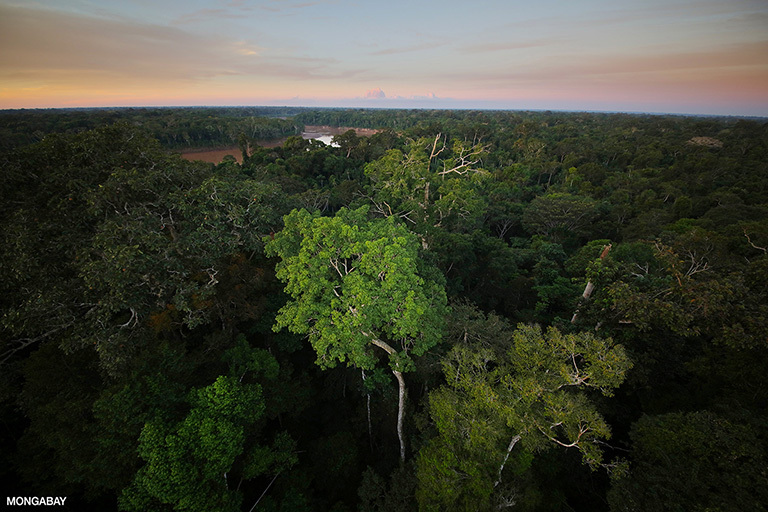 Rappaport and her co-authors determined that degradation due to fire and logging resulted in persistent changes in forest canopy structure, habitat that is critical to arboreal organisms such as saki monkeys in Peru. LiDAR data’s remarkable precision does come at a cost that is prohibitively high for most research teams. Since the technology was only recently developed, historic LiDAR data are not available, so change over a long time series cannot be observed. Historic satellite data, such as from the Landsat series, come in great use. The Landsat satellites have been operating continuously for 46 years, and the two currently orbiting satellites, 7 and 8, in combination record freely available images of almost the entire globe in an eight-day cycle. Although the images do not have the spatial resolution of LiDAR [each Landsat pixel is 30 meters (98 feet) across], Landsat complements LiDAR with resolution across time. LiDAR and satellite imagery can record forest structure across space and time, but determining a ratio of carbon per tree or hectare requires on-the-ground assessment of stored carbon. The researchers used tree species and size data from ground-based carbon inventories to estimate the amount of carbon the trees sequester. In combination, the three methods can be very powerful for measuring forest carbon stocks. “Our work to combine forest inventory measurements, airborne LiDAR, and Landsat time series serves as a blueprint for the synergistic use of multiple datasets to estimate carbon emissions from forest degradation,“ Rappaport said. Using this multifaceted approach, Rappaport and her colleagues estimated the loss of carbon due to forest degradation and the relative contributions by logging and fire. Their estimates of carbon loss due to fire were about three times higher than such estimates derived from field experiments or forest inventories in previous studies. Additionally, forests that experienced three or more recurrent fire events in 15 years or less were left with an average of 10 percent of the carbon stock found in the original forest stand. The researchers conclude that fire has the potential to release more carbon stocks than either selective logging or clear-cutting. And conditions may only get worse for the Amazon: projections of more frequent and intense droughts suggest hotter, bigger fires. Map of degraded and intact forest stands in the Brazilian state of Mato Grosso, where researchers from University of Maryland and NASA recorded forest degradation from fire and logging via ground-based, satellite and LiDAR data. Forest appears green, deforested areas appear pink, and circles indicate the center of forest stands with LiDAR coverage (see key for color code; U—undisturbed; L—logged; LB—logged and burned; B—burned). Figure from Rappaport et al. (2018). Quantifying long-term changes in carbon stocks and forest structure from Amazon forest degradation. Environmental Research Letters, 13. Although high-resolution data from sources such as LiDAR can reveal somber findings, acquiring an accurate depiction of the full amount of carbon lost due to both deforestation and degradation is critical to understanding – and preventing – anthropogenic disturbance of forests. Rappaport recommends that their findings be used to update guidelines for monitoring carbon stocks present within intact and degraded forests, a key requirement for countries seeking performance-based payments from reducing emissions from deforestation and forest degradation (REDD+) programs. Additionally, because their high-resolution methods revealed that forest carbon stocks vary by about two orders of magnitude, the authors recommend multiple classes of degraded forest under the REDD+ framework. Such baselines and classifications are critical to determining the readiness of a nation to begin a REDD+ program and to monitoring the amount of carbon stock retained. The United Nations and World Bank fund two of the most prominent REDD+ programs, and partner countries, including every Amazonian nation but Brazil and Venezuela, must regularly monitor and report forest carbon stocks. If the monitoring process does not capture the full amount of carbon lost due to forest degradation, participating nations may be given more credit than is deserved. 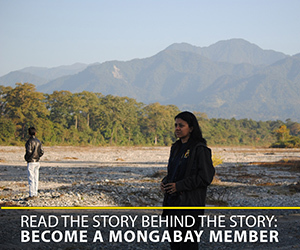 A refined understanding of the drivers of forest degradation can also refocus preventative efforts. The World Bank and the International Union for the Conservation of Nature (IUCN) quickly deployed fire control projects in the aftermath of the massive El Niño drought across the Amazon in 1998. With the provision of additional mapping of forest damage due to fires, and with organizations such as Brazil’s National Institute of Space Research taking note, widespread preventative initiatives could be revitalized. Although some international policy currently lags behind cutting-edge forest monitoring capabilities, it would not be the first time that remote sensing data has induced policy change.